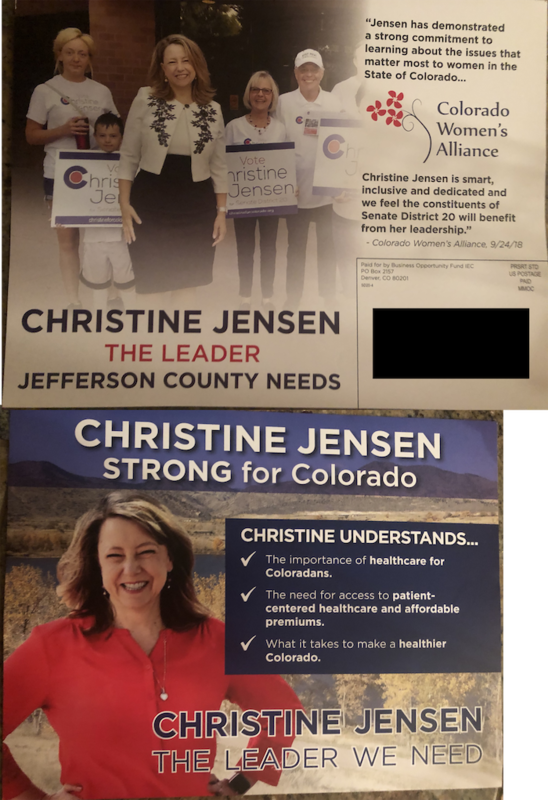 This mailer from super PAC Business Opportunity Fund notes a Colorado Women's Alliance endorsement of Republican Senate candidate Christine Jensen. The mailer focuses on health care, with few specifics. You can find a PDF of the alliance's 2014 talking points here. The group's issue pages advocate for natural gas development and for repeal of the Affordable Care Act, which the group says hasn't worked. Jensen faces Democratic state Rep. Jessie Danielson in an open Senate seat centered in Arvada and Wheat Ridge. This state level independent spending committee may take unlimited donations and spend unlimited amounts as long as they don't coordinate with candidates. Thus far this year, the Business Opportunity Fund received $15,000 from the Colorado Economic Leadership Fund, and $5,000 each from nonprofit Ready Colorado and super PAC Better Schools for a Stronger Colorado. As of Oct. 10, the group was $426,000 in the red.